I have always been what I call Husky…but we all know what that means. Over the years I have watched success story after success story, but just assumed that I didn’t have the type of body that could achieve the “after photo” results that we see on TV. I knew what it would take to get there, but never had the motivation. Sure I would get frustrated and diet for a month and hit the elliptical for 30 minutes a day, but I never changed my lifestyle. I would always end up back where I started after seeing the smallest drop in weight, thinking “now the hard work is over”. I have also always been very self-conscience about people seeing me without a shirt on; the pool, lake, frisbee at the park. A cutoff t-shirt was good for me. Don’t even ask if I would be on skins in basketball. I was sick of being embarrassed of my body. Finally I decided to purchase the P90X series about 6 years ago and apparently you have to PUSH PLAY to get results. It wasnt until one night that I looked in the mirror and was completely disgusted with myself. I had let my family down by being a poor example. I had let my savior down by not taking care of the body He blessed me with, and I let myself down because I knew that I could have the results I wanted if I could just commit. Like many of you, I hopped on youtube to look at some results video to get some motivation to get started again…Attempt #8. Something changed this time though. I found this dude Coach Wayne on youtube, joined his team, and the rest is history! I will admit it openly that after 5 months of P90X, i got some great results, but not the results I wanted. I was doing about 60%-70% of the workouts and my nutrition was not a #1 priority. Well, in week 6 of Round 2 with 100% dedication to PUSHING PLAY EVERYDAY with the motivation of coach Wayne, I got awesome results!!! I even decided to give Insanity: The Asylum a try! I dropped down from 228lbs and 27% body fat to 178lbs and 7% body fat!!! 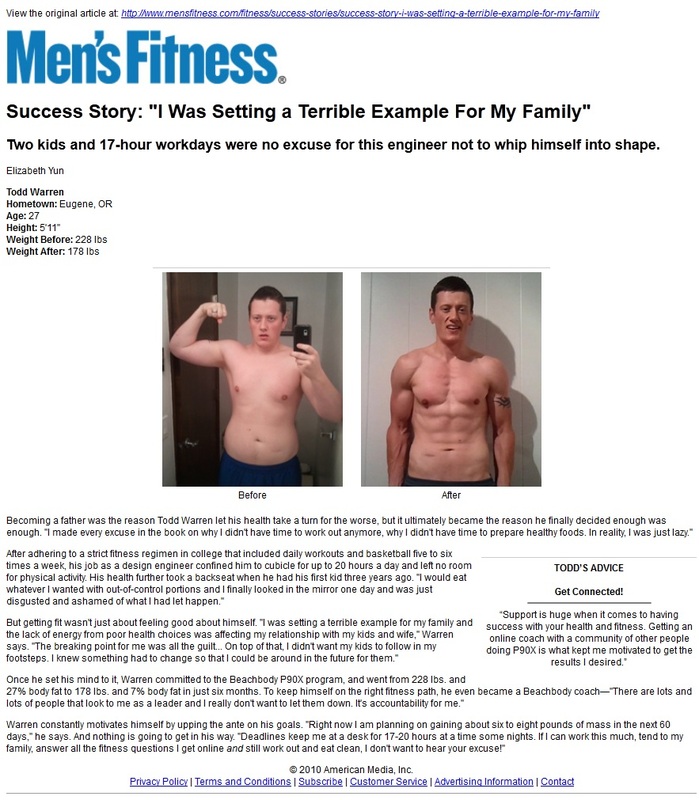 A lot of people started to take notice of my results including Mensfitness.com when I was selected as their transformation of the month! Not only that, but I won $1000 in the Beachbody Challenge as the January 2012 Shakeology Transformation of the month! Its a journey! And I am not done! In comes P90X2 to revolutionize my fitness! You can check out my P90X2 results here below, but I dropped another 6lbs and got down to 5.5% body fat!!! I have never felt better in my entire life and its my goal to show as many people as possible how they can have the same success that I have had. Thats exactly why I created RIPPEDCLUB.net, so that people just like yourself can have access to all the keys of my success, as well as being a part of a community with a common goal! But all this success that I have had and all this things that I have created as a result are because of something much bigger. One of the main reasons for my desire to change was my faith in Christ. He tells us that we are to be good stewards of what He has given us, including our bodies. That was very convicting for me. Through Beachbody, their programs like P90X, Asylum, and P90x2; along with Shakeology and other Beachbody supplements, I am able to glorify my Lord by taking care of what He has given me. I think that one of the great keys to success is having a team beachbody coach. We need someone who has gone before us and been successful. Someone who can lead us by answering questions, motivating us when we want to give it 60%-70% lol…Direct us to the nutrition and supplements that we know will work (we use them). I chose my coach very carefully. I wanted someone that achieved amazing results and knew what it took to get there. Now that I have acheived the results I want, I am able to lead others by example and its is an amazing privelege and blessing to be a part of changing hundreds and thousands of lives with my story. If you are like me and have failed numerous times to get your health, confidence, energy, and life back….Do yourself a favor and get plugged in with a coach and a team! If that coach is me…awesome! I would be happy to have you become a part of RIPPEDCLUB and absolutely look forward to working with you. If its some other coach…thats cool too! I just want you to have the type of success that I have had and experience the change in lifestyle that I have experienced. Take it from me, the guy who failed P90X 7 times before losing 56lbs and almost 22% body fat. Its possible and I can help you get there!